Welcome to the blog of Mrs. Crew, Superintendent of the Tecumseh Local School District! Mrs. Crew will focus on news about the district, interesting student work, and achievements by students and staff on this blog. She will also share information about pertinent educational topics. During the April Board of Education meeting on April 16, 2019, the BOE members approved a policy designating Tecumseh Local Schools as a Tobacco-Free campus effective August 1, 2019. This will include smoking, oral and electronic products. This decision was made in an effort to provide a healthy environment for our students, staff and community members and visitors to our district. We thrive to ensure our district is a safe zone. We have worked to increase our safety measures in the district and part of a safe environment includes promoting a healthy environment. It is imperative that the district set the example for our students. If you have any questions regarding this policy please do not hesitate to contact me at paula.crew@tecumsehlocal.org. The 22nd Annual Hall of Honor Ceremony was held this weekend at Tecumseh High School. The inductees this year are Mrs. Linda Clements, Mr. Ron Hamm, Mr. Howard Stahl and Mr. David Vernier. Mrs. Linda Clements was a teacher for thirty-six years. She began her career in Clark County at Enon Elementary. Before moving to Tecumseh Local Schools, she also taught in the Northeastern and Northwestern School Districts. She retired from Olive Branch Middle School in 1999. She has volunteered many hours helping to create the concept and maintain the Advance School House, which opened in 2003. The Advance School House, located just outside of New Carlisle, welcomes elementary students throughout the area to experience a school day in the life of a student in the 1800’s. Mr. Ron Ham is a 1988 graduate of Tecumseh High School. During his younger years, he took up motocross racing and this passion took him all over the Midwest racing at the national level. He attended the Ohio State University and studied mechanical engineering. Mr. Hamm is the creator of a mobile phone game titled Door Slammers, which is a drag racing game that is played worldwide. Mr. Hamm also has created a racing simulator allowing people to see what it is like to race a car. He has brought the simulator to Tecumseh High School and has spoken to industrial arts classes about the importance of science, math and trade skills. Door Slammers awards a $5000 scholarship each year for the annual Golden Hammer Senior Award and supports the Student of the Month for an industrial arts student. Mr. Howard Stahl began his career in education at Tecumseh Local Schools in 1964. He remained and served in education at Tecumseh for the duration of his thirty-seven year career. His first assignment was at Olive Branch Junior High for two years in the Social Studies Department before being assigned to the new New Carlisle Junior High School building, completed in March of 1967. At New Carlisle Junior High, he continued teaching social studies and coaching freshman basketball. Mr. Stahl began his administrative career at New Carlisle Junior high School in 1975 as assistant principal, then moved to principal in the fall of 1976, and remained in that position until 1981 when he moved to unit principal at Tecumseh High School. In 1988 he was promoted to the central office as Director of Buildings, Grounds, Transportation, and Food Service overseeing and directing all work and services in those areas until his retirement in 2001. Mr. David Vernier is a 1965 graduate of Tecumseh High School and a 1969 graduate of the Ohio State University. He received his M.S. Degree from Oregon State University in 1975. Mr. Vernier started a company titled Vernier Software and Technology in the early 1980’s and now the company employees 105 people and it is well-known among science teachers around the country. They sell their products in over 100 countries around the world. Mr. Vernier was CEO for thirty-four years and now is Co-President of Vernier Software and Technology. He is involved with the company on a daily basis developing new products and promoting the use of Vernier products in STEM education. Mr. Vernier is also on boards or involved in other ways with numerous education, environmental, and social service charitable organizations. What a rewarding opportunity it was to see these four inducted into the Tecumseh Hall of Honor yesterday! It is an opportunity to honor those who have graduated from our district and/or have had a positive impact on our district. What wonderful role models these individuals are for our students. Unless there are unusual circumstances, an honoree should be a graduate of Tecumseh Local Schools or have attended at least two of four years of high school in New Carlisle. A period of five years must have elapsed between graduation and eligibility for induction into theTecumseh Local Schools Alumni Honor Roll. Hall of Honor nomination forms are available on our website: tecumseh.k12.oh.us. Excellence in all we do through dedication and integrity. The next phase includes the creation of four “action teams” each concentrating on one goal area. These teams started meeting this week and will prioritize and develop specific action steps to help attain each goal area. We will keep you updated on the important work of the action teams. I’d like to express my appreciation on behalf of the district to those individuals who served on the core strategic planning committee this year. Those members included:	Kevin Becker, Jacob Berner, Maggie Bollar, Johanna Brents, Kerry Cassell, Veronica Cassidy, Paula Crew, Roger Diller, Brian Dixon, Julie Driskill, Elaine Estes, Doug Frank, Ivan Gehret, Sam George, Steve Graham, Angie Greene, Jason Hanrahan, Natalie Jackson, John Loney, Cara Mansell, Sue Anne Martin, Melinda McKibben, Beth Moore, Robin Peck, Amy Perkins, Kathryn Randenburg, Denise Robinson, Stephen Rudnicki, Peter Scarff, Corinne Scott, Suzanne Slagell, Suzy Stapleton, Dale Steinlage, Dan Studebaker, Susan Wile and Katy Wright. If you have any specific questions regarding this work, please do not hesitate to contact me at paula.crew@tecumsehlocal.org. Tecumseh Local Schools has offered breakfast, free of charge, to all students in the district for a number of years. In October of 2017, we were informed the government would no longer reimburse our district, along with other districts throughout Ohio, for this service. At the time, we had already communicated to parents that breakfast would be offered to all free of cost. Therefore, we selected to continue the remainder of the year offering this opportunity to our students, recognizing it was a help to many. We examined the total cost to the district for this service at the end of the 2017-2018 year and determined we could continue to offer a free breakfast to all students again during the 2018-2019 school year. During these two years, the Child Nutrition Department has covered the breakfast costs, which has totaled approximately $169,000 each year. The Child Nutrition Department must, as determined by federal government regulations, be a self-sustaining entity. Therefore, we are at the point in which we can no longer sustain this service for our students unfortunately. Thus, beginning with the 2019-2020 school year, Tecumseh Local Schools will be unable to provide a free breakfast for our students. We will continue to offer breakfast at each building and students who qualify for free or reduced meals will still be eligible. Students who do not qualify for free or reduced price breakfast will need to pay for breakfast. We are currently evaluating the cost for full-pay students and will communicate that soon. Recently a group of our staff members participated in a free, all-day Mental Health First Aid training. The National Alliance on Mental Health (NAMI) received a grant and several school districts, including Tecumseh Local, were among the recipients. We had approximately twenty-five staff members participate in the full-day training. The presenters shared valuable information with the group to include various mental health diagnoses, prevalence percentages of mental health occurrences among children, and strategies for supporting the needs of students with mental health issues and students with trauma-sensitive needs. The data they shared on the prevalence of mental illness is important for all to know. For example, approximately 1 in 5 youth ages 13 - 18 experiences a severe mental health disorder and 13% of youth ages 8 - 15 experiences a mental health disorder. That is a startling figure. In addition, as our staff is very well aware, we have students who, although they may not have a mental health disorder, they routinely face challenges outside of our district domain that children should not have to face. We have students who experience poverty and all that entails, students who have a parent or parents afflicted with an addiction or lost a parent to an addiction, students who are being raised by grandparents, other relatives, neighbors, etc. We have a number of students who meet the definition of a homeless student; either living in a vehicle, a campground, a homeless shelter, with another family, etc. Goal two of our District Improvement plan focuses on the need to support the social and emotional needs of our students. As a district, we have concentrated on efforts and strategies to support our students, especially over the last several years. The recent training is an example of such a strategy. Our district has had a mental health committee in existence for the past four years. Members of this committee meet on a regular basis to strategize meeting the social and emotional challenges of our students. Currently, we are working to bring another Mental Health First Aid Training to the district later in the spring. Most of our staff members, including myself, are not therapists, counselors, or psychologists. Yet, we can all be cognizant that times are certainly different in education than they use to be. We have students, for multiple reasons, facing unique challenges that were not in existence, or not as prevalent as they are today. We are committed to helping provide an environment in which all students can learn to the maximum extent. For this to happen, we must continue to provide an educational environment that supports the social and emotional needs of our learners. Tecumseh Local Schools was selected to be part of the Clark State Scholars Program this year. This program has been in existence for fifteen years. The program provides a three-year scholarship, including the cost of all books to graduating students. It’s a unique program in that the students are selected during their eighth grade year. An adult mentor is assigned to each student and meets with the student routinely throughout his or her high school years to help him or her stay on track and prepare for college. We were fortunate to recently have eleven eighth graders selected for this opportunity. This past week the selected students, along with those selected from Clark-Shawnee, Springfield City, Urbana and Graham Schools, were honored at a ceremony at Kuss Auditorium. We are very thankful and appreciative to Clark State College for including our district in this program. These opportunities will certainly open doors for many students! Thank you to the above educators for taking the time to go above and beyond by writing and securing a TEF Educator Grant! The Tecumseh Education Foundation (TEF) has been in existence since 1993. The purpose of this non-profit organization is to help promote opportunities for students through scholarships and educator grants. The committee also helps support the Hall of Honor Program that honors former Tecumseh students, employees and community members. Thank you to these committee members for donating their time on behalf of Tecumseh Local Schools. TEF members include: President Kevin Harmon, Rita Lane, Anthony Fraley, Drew Gross, Matt Heinl, Reed Romine, Robin Peck, Zach Rapp, Jim Suver, and Sue Anne Martin. As I reflect on the holiday season I’m awed by the giving spirit of our students and staff at Tecumseh Local Schools. The many acts of kindness through giving and providing for others is a true testament of the culture at Tecumseh. The high school student council organized an Arrowthon, providing games and gift baskets. All profits were donated to the Dayton Children’s Hospital to support children and families during difficult times. Staff members helped organize this event as well and many of you supported by attending or purchasing tickets for the raffle baskets. Our AFJROTC cadets once again collected food and money for needy families here in the community. The cadets work quite diligently to make sure each of the adopted families had plenty of food for a holiday feast and money for Christmas presents. The Child Nutrition Department and the FFA Program helped out with this endeavor as well through the donation of food. Our schools had various food drives, along with warm fuzzy drives (hats, scarfs, mittens) throughout the holiday season and donated the collections to local organizations such as Impact Bethel and the local food pantry in New Carlisle. Our School Resource Officer, Deputy Loney, launched a coat drive for needy students in the district and participated with the Shop with a Cop program benefiting Tecumseh students who were afforded the opportunity to purchase presents. The high school Junior Optimist members spent a month collecting small gifts and items of necessity and gave twenty-five wrapped shoe boxes to teenagers in a local homeless shelter. Students and staff provided community outreach programs, such as visiting a local nursing home to read holiday stories to the residents, as well as inviting parents and grandparents into the schools and classrooms for celebratory events, to include the awesome holiday concerts and programs throughout the month of December. Our high school choirs shared their talents by visiting all schools to share holiday songs with our students and staff. Our staff also gave the gift of creating a festive atmosphere for students and all who visit the schools to enjoy. One had to merely walk the halls to experience the above and beyond efforts made to adorn the schools with a festive holiday spirit. This is not an exhaustive list of the giving spirit and efforts to help others during this time of the year. It’s merely a small representation of the efforts and kindness shared by the students and staff at Tecumseh Local Schools. It’s an honor to be part of the Tecumseh Local School district and the Arrow family. May 2019 bring us continued reasons to celebrate and share with our students the act of giving and paying it forward for others. In Arrow PRIDE! Mission Statement: Tecumseh Local Schools is the driving force behind a community of diverse and proudly connected Arrows. We are relentless learners who strive to become better tomorrow than we were today. Vision Statement: Learning for All ~ Whatever it Takes! The mission statement is the “work” that we do as a district to realize the vision statement. Hopefully, you recognize the vision statement, as we have embraced this statement for several years. The mission is new and the committee is excited to develop goals that will help us realize our mission statement. I will continue to share information regarding the strategic planning process as our district plan develops. I greatly appreciate the time and effort of the committee members! We are fortunate to have newer buildings at Tecumseh Local Schools. It’s hard to believe it is going on close to twelve years since the new buildings were completed. The first two, Medway Elementary and Donnelsville Elementary were completed in August of 2006. The completion of Tecumseh Middle School, New Carlisle Elementary School and Park Layne Elementary School were opened in January of 2007. Tecumseh High School opened in August of 2007. Our students are afforded the opportunity to enjoy an education within the newer buildings. This is especially beneficial for climate control, as regardless of the weather outside, our students and staff can have the comfort of quality heating and air to ensure their comfort. We also have a sense of pride when we have parents, community members and visitors from other districts attend events in our buildings, as they are quite stellar. I would like to share with our community that we are taking appropriate proactive measures to keep our buildings in the best shape possible. We have an incredible team of custodians at each of our buildings that work diligently to maintain the cleanliness and upkeep of the buildings. Their routine diligence keeps our buildings looking new. In my opinion, it would be difficult to find a more dedicated custodial team than we have at Tecumseh Local Schools. Many visitors to our schools have commented that it is hard to believe the schools are over a decade old given the pristine condition of the buildings. Another area in which we are being proactive in the upkeep of our buildings is the work we have done to create a capital outlay plan for spending purposes. Specifically, our treasurer, Denise Robinson, Asst. Superintendent Ivan Gehret, our Maintenance Supervisor, Roger Diller and myself have worked this fall to develop this plan. Essentially, we are mapping out the upkeep and replacement of necessary items based upon identified need and available financial revenue. We work to find strategies to elongate the life of our HVAC systems and roofs at each building, as these are the major high dollar replacement cost items. For example, this summer and fall we had an infrared scan completed on all school roofs. The scanning report identified areas of moisture under the roof that could not be detected with a routine inspection. As a result, we were able to take corrective action on these identified areas instead of waiting until the areas were damaged to the point that we would have to replace sections of the roof(s). We are cognizant of the need to stretch the life of our newer buildings to ensure we are getting the maximum amount of years possible. We continue to be appreciative of our newer buildings and extend our gratitude to our voters who made this possible over a decade ago. If you have any questions or would like additional information, please contact me at paula.crew@tecumsehlocal.org or 937 845-3576. Tecumseh Local Schools is currently involved in the development of a comprehensive strategic planning process. A committee has been organized that includes board members, staff, parents, and community members. At our second meeting last week, members of the administrative team shared a State of the Schools presentation with the committee. The information was designed to provide demographic and financial information, along with specific initiatives underway in the district. Committee members indicated the information was informative. Thus, this prompted me to want to share a bit of this information via my Blog for our collective community to provide you with specific information about our district. One initiative that we are working on at Tecumseh Local Schools includes providing support for the whole child, to include working to create an environment where all students find success. We have established a Mental Health Committee in the district, comprised of administrators, school counselors, school psychologists, a school nurse, and our School Resource Officer. Together, the committee analyzes the barriers our students encounter and strategize to implement research-based strategies to meet their specific needs. Specifically, we have worked to increase mental health services and supports for our students, as we find this area to be of great need for many of our students. We have added a guidance counselor beginning this school year to serve the elementary schools, where previously one did not exist. We recognize the need to routinely offer bullying prevention programs and assemblies for our students, as the reduction of bullying behavior is of upmost importance. Recently, the State Superintendent of Public Education for Ohio, Paolo DeMaria, visited our district. He indicated he wanted to visit, as he was intrigued and had heard about the district’s work in this area. The district will continue to promote opportunities to meet the needs of the whole child. This is imperative, as our students will not realize maximum learning if the barriers that impede their education are not addressed. Please contact me at paula.crew@tecumsehlocal.org if you have any questions, or would like additional information. At Tecumseh Local Schools, we are cognizant of the need to maximize the use of financial revenue generated though local tax dollars and state aid. Since the onset of the school year, we have strategized to save the district substantial costs in multiple areas. A large expenditure in all school districts is the cost of copy machines that are needed in all school buildings. The contract with the current company we leased the copy machines from ended at the end of last school year. We worked diligently to explore other potential companies that we could lease from in an effort to reduce costs in this area. Through the diligent work of our Treasurer Denise Robinson and our Technology Coordinator, Veronica Cassidy, we were able to enter into a lease agreement with a different company. The previous leasing agreement cost the district $100,000 annually, and the new contract will cost approximately $50,000 annually, thus a $50,000 savings. Treasurer Robinson, Asst. Supt. Gehret and myself spent quite a bit of time investigating the trash removal cost this summer as well, as this is another costly expenditure for school districts. Previously, the district paid approximately $77,000 annually for this service. We explored potential strategies to save costs in this area. We were able to find different company that provides recycling opportunities that will help the district save major costs in its trash removal. The new cost for our trash removal is approximately $27,000 annually compared to the $77,000 previously, thus another $50,000 savings. This was a two-fold positive, as we saved cost and majorly reduced the amount of trash going to area landfills through recycling efforts. We have not passed a levy for new money in over twenty years at Tecumseh Local Schools. Therefore, it is imperative that we be as strategic as possible with the funding we receive through local tax dollars and state aid. We strive to provide the best education for our students with the financial resources that are generated for the district. Strategizing to save cost in areas such as those detailed above, will help provide opportunities for our students, such as updating the much needed curriculum resources for example, so our students can be successful and be on a level playing field with students in other districts. I'm happy to answer any questions or discuss our finances and cost-saving plans and initiatives if you would like more information. Please contact me at paula.crew@tecumsehlocal.org. We have a District Leadership Team that met this week to conduct curriculum visits. The District Leadership Team (DLT) is comprised of the district administratiors and several teachers representing each school. The purpose of the DLT is to oversee the District Improvement Plan and make appropriate changes to the plan as needed. There are three goals on the plan: Goal One focuses on student academic learning and improvement. Goal Two focuses on supporting positive behavior and the mental health needs of our students. Goal Three focuses on the incorporation of technology useage by teachers and students to enhance student learning. Three times a year the DLT conducts Curriculum Visits. The Curriculum Visits are an opportunity for the DLT members to ascertain the degree to which the strategies outlined in the District Improvement Plan are being incorporated within the classrooms. A curriculum visit checklist is used to record evidences of specific strategies used. The DLT analyzes the data to determine what areas we need to give additional attention to as identified in the District Improvement Plan. This is a group of committed educators working diligently to improve student learning and achievement. Tecumseh Local staff, joined by the Northwestern Local staff, listened to a presentation by Tim Kight today. Tim Kight is the Founder and Chief Executive Officer of the Focus 3 Foundation. He works with many organizations, including the Ohio State Football team. Tim helps organizations align the power of leaders, culture, and behavior to achieve results. His message in a nutshell is to strive to manage our responses to any given situation, whether it be in the work setting, or in our home lives. The concept E + R = 0 seems simple, but it's quite powerful. The "E" respresents the events we encounter daily. We all encounter situations or events everyday. They are going to happen and we can't stop them...but our response or our "R" will determine the "O" or the outcome of those events. We can choose to have a "below the line" response, which will negatvively affect the outcome, or we can choose to have an "above the line" response which will help us problem solve and learn from the event. We are striving to choose above the line responses at Tecumseh Local Schools. Students and staff members have worked hard to get back into routines for the start of another school year. Several new positions were added to the district in an effort to support students, staff and parents. We have partnered with the Clark County Commissioners and the Clark County Sheriff’s Department to hire a full-time School Resource Officer, dedicated solely to Tecumseh Local Schools. Deputy John Loney, our SRO, has worked diligently to help provide a safe environment. He has strived to meet as many staff members and students in his short time with us. The connections and positive relationships he is making with our students are quite impactful and, often times, can assist in proactively deterring potential issues and safety concerns. We would like to thank and acknowledge the Clark County Commissioners for their financial support to cover more than half the cost for Deputy Loney. We’d also like to thank the Clark County Sheriff’s Department for supporting the SRO Program at Tecumseh and throughout Clark County. All school districts have experienced an increase in the number of students who are in need of counseling services and mental health services. At Tecumseh Local schools we have many initiatives in place to help support our students in this area. Prior to this year, we had guidance counselors at the middle and high school. Recognizing our elementary students, staff and parents are in need of more support, we created a new guidance counselor position beginning with the onset of the school year. Mrs. Meagan Wagner, our new elementary guidance counselor, divides her time between Donnelsville, New Carlisle and Park Lanye Elementary Schools. We have established a mental health committee at Tecumseh Local Schools. The committee works to determine the specific needs in our district and researches potential strategies and initiatives that will support this area most effectively. Recently, the district offered staff members, parents, and community members the opportunity to complete a survey. The survey is the first step in a comprehensive strategic planning process we are embarking on at Tecumseh Local Schools. We had an excellent response to the survey, with close to 600 individuals completing it. We would like to thank those who took the time and effort to respond. We are currently in the process of organizing a strategic planning committee. Individuals on the committee will include staff, parents, and community members. During the first meeting, scheduled for October 11th, committee members will analyze the survey responses, which is the first step in creating a strategic plan. It’s an honor to work at Tecumseh Local Schools. We have dedicated staff members, parents, and community members that work hard to provide an excellent educational opportunity for our students. If you have any additional questions, or would like more detail about the information shared, please do not hesitate to contact me at paula.crew@tecumsehlocal.org. I welcome any opportunity to talk with you about Tecumseh Local Schools. An Outstanding Start to the School Year! We are off to a great start to the school year. I’d like to express my gratitude to ALL of our staff members who worked diligently to prepare for the return of our students! Each contributed to this team effort in a unique way. I’d also like to thank the parents for helping your students return to a new school year, attending open houses, and sharing your child with us! We’ve had a busy first week with many positive initiatives happening throughout the district. I’m not sure if you are aware, but we have collected plastic bottle lids as a district for the past year. The students in Mrs. Wright’s classroom at Tecumseh High School started this recycling project with a goal to collect 400 pounds. This amount of plastic lids can be converted into a recycled bench. The students reached their goal last year, and a red and black bench is now located at the west side of Tecumseh High School for all to enjoy. What we found is people continued collecting the lids and turning them into the district. So, what began as a single-class initiative, morphed into a recycling project with the entire district and community involved in the collection of plastic lids. This collection went on throughout the year and into the summer. On our first day of school the lids were weighed and loaded into a large box truck. The total weight…one ton! The plastic was taken to a recycling center and in exchange, Tecumseh Local was given FIVE more recycled benches! The benches will be donated to different schools and throughout the community in the next couple of months. We are still collecting plastic lids and plan to continue with this recycling project in the future. The momentum of the community and the district working together to make this happen is exciting. What this tells us is we can do anything if we work together as a united front. I’m looking forward to the many more things we can do together for the betterment of our district, our community, and most of all our students! Our bus drivers participated in safety training this week. Drivers reviewed appropriate responses to take if dangerous situations develop on the school bus. Some of the scenarios they practiced responding to included an intruder coming on the bus, a weapon on the bus, and evacuating the bus in the event of a fire. I'd like to extend the district's appreciation to the New Carlisle Fire Department and the Bethel Fire Department for their assistance and expertise today. They helped by fogging the bus to simulate smoke in order to make the drill more authentic. Drivers took turns practicing evaculating students under these conditions. Safety and security is continuously on our radar at Tecumseh Local Schools. We continue to explore additonal methods to provide training for our staff and implement addditonal safety measures at Tecumseh Local Schools. The Clark County Fair begins today through next week. This is the exciting culminating event for many students, staff and parents of our district, as it reflects hours of preparation and hard work. The students, and often times parents as well, have spent hours caring for their livestock and animals throughout the winter and spring months. This includes routine early mornings and late night feedings and cleaning of stalls. The FFA Proram at Tecumseh Local Schools provide students an opportunity to develop a strong work ethic and responsbility as they care for their animals. I encourage people to take time to visit our students at the barns as well as the numerous students projects at the fair. Thank you for all involved in making this opportunity possible for our students! Welcome New Administrative Team Members! I am thrilled with the additions to the administrative team we have to begin a new school year at Tecumseh Local. The change started with our new Treasurer, Denise Robinson in January. Denise has been a crucial addition to our team, as her years of experience as a school treasurer has already resulted in major savings in several areas for the district. More recently, the BOE approved the promotion of Mr. Ivan Gehret from High School Principal to Assistant Superintendent. Although he officially begins this position on August 1st, he has already started taking on projects and responsibilities this summer. I am looking forward to partnering with Mr. Gehret to lead this incredible district. At the board meeting last week, the BOE approved the hire of our new High School Principal, Mr. Aaron Oakes. Mr. Oakes comes to us from Tipp City High School, where he served as the Assistant Principal. Mr. Oakes plans to continue with the implementation of PBIS at the high school, which is a system that provides positive systems and strategies of support to serve all students. This is something I support and feel strongly about to help our students succeed, regardless of the barriers they face. 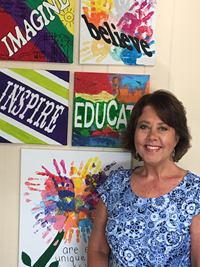 Lastly, the BOE at Tuesday's meeting approved the hire of Ms. Beth Moore as our new Curriculum Specialist. Ms. Moore has taught fifth grade in our district for close to twenty years. Her expertise is in the area of reading literacy, curriculum development and data analysis. She will be a vital asset to assist our administrative team and staff as we continue to improve the learning process for all students K-12. This is an exciting time at Tecumseh Local Schools as we add these new positions to an already excellent administrative team. Safety and security measures are contstantly on the forefront at Tecumseh Local Schools. The Board of Education and our staff continuously evaluate our needs and execute plans to maximize the safety for our students and staff. Most recently, the Board of Education approved the hiring of a School Resource Officer assigned solely to Tecumseh Local Schools. We'd like to welcome Deputy John Loney, who will be our School Resource Office effective with the onset of the upcoming school year. Deputy Loney's office will be at the high school, but he will be actively involved with students and staff in all of our school buildings. Deputy Loney is a veteran deputy with the Clark County Sheriff's Department and he is excited to get started! We'd like to extend our appreciation to the Clark County Commissioners who stepped up to help cover over half the cost for employing Deputy Loney. They were receptive of our request for assistance, which I appreciate on behalf of the welfare of the Tecumseh Local School District. We'd also like to express our appreciation to personnel at the Clark County Sheriff's Department for their support and assistance in making the School Resource Officer program possible. There are several food programs available for our students this summer. Impact Bethel will once again be hosting their annual summer lunch program. Free lunches will be served to area children starting Monday, June 4th through Friday, August 3rd at two locations. The locations include the shelter houses in Smith and Raynor Park. The Park Layne location will move to Good Shepherd United Methodist Church on days it rains. The program is available for children up to eighteen years of age who live in the Tecumseh Local School District. Second Harvest Food Bank will host a summer food program every Tuesday, Wednesday and Thursday at New Carlisle Elementary beginning June 12th and ending July 26th from 1:15 – 2:15 for students eighteen years of age and younger. Students will receive a box lunch that will usually be a hot meal. Students will also receive fresh fruit and vegetables and a “go pack” of non-perishable food each Thursday to take home. A food pantry will be available on these days for parents to visit. We are fortunate to have these organizations and volunteers to assist with summer food needs. Please contact me at paula.crew@tecumsehlocal.org with any qeustions. I am honored to be the next superintendent of Tecumseh Local Schools. We have an amazing district with a team of dedicated staff that strive to meet the needs of all students. Communication is paramount. My plan is to use this Blog platform to share information and events, as well as celebrate the successes happening at TLS. I welcome questions and communication you may have for me. My email address is paula.crew@tecumsehlocal.org. Please do not hesitate to contact me if you have quesitons about our school district. "Learning for All ~ Whatever it Takes!" Mrs. Paula Crew has served as an administrator with Tecumseh Local Schools since 2003. She spent a decade as the Director of Special Education and Professional Development, and five years as the Assistant Superintendent, until her promotion to Superintendent in the spring of 2018. Prior to working at Tecumseh Local Schools, Mrs. Crew began her career as a teacher for students with special needs followed by an assistant principal at Clark-Shawnee Schools. She is also a veteran, serving six years in the military. Mrs. Crew enjoys being actively involved in many of the school and community initiatives and events and has a passion for education and Tecumseh Local Schools. Her educational philosophy supports that of the district, Learning for All ~ Whatever it Takes!